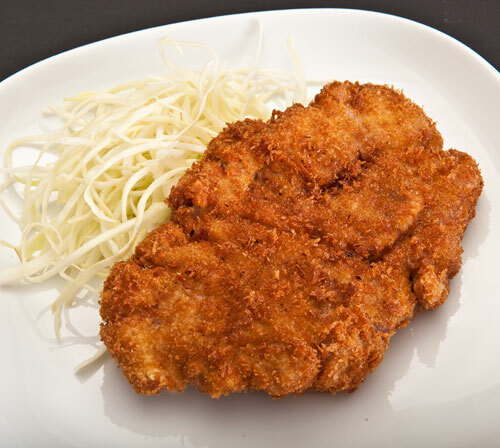 Tonkatsu is a typical Japanglish word - ton is pig or pork, and katsu derives from the word cutlet. Tonkatsu is one of the western-style Japanese dishes that can be classified as yohshoku. However, tonkatsu is so popular in Japan that there are even restaurants that only serve tonkatsu and similar items such as kushikatsu (bite-sized fried bits of pork and other things on a skewer). One of the key ingredients for tonkatsu, or any breaded deep-fried item in Japanese cooking, is panko. In recent years panko has been adopted by the trendy world of cuisine, but it's not anything special - it's just dried bread crumbs. The thing that makes panko unique is that the flakes are bigger and crunchier than the kind sold by non-Japanese food manufacturers. You can buy panko ready-made at Japanese food stores, or make your own. To make your own, take off the crusts of day-old good white bread. Flake the white part of the bread by hand, not the food processor, which would turn the bread into powder. Spread out the bread crumbs on baking sheets and dry in the oven at a very low temperature until the crumbs are thoroughly try - not colored, just crunchy. You can store this in tightly sealed plastic bags or containers for quite a long time. This deep fried pork dish is one of the most popular Japanese meat dishes. Trim the cutlets if necessary to get rid of any excess fat. (Note, some tonkatsu afficionados leave the fat on, but I like to cut it off.) Make small cuts all the way around the cutlet. This prevents it from shrinking and curling up when cooked. Lightly season the cutlets with salt and pepper. Dust the cutlets in flour, then dip in the beaten egg, coating the surface thoroughtly. Finally roll in the breadcrumbs. Heat the oil to medium heat, about 170°C / 340°F. Deep fry the cutlets in the oil, turning a couple of times, until golden brown. You can tell if it's done by poking it. If it feels firm, it's done. If it yields to pressure, then it's not done yet. Drain thoroughly. Cut with a sharp knife into slices while still hot. Arrange on a plate with finely shredded cabbage, and condiments to taste: lemon wedge, mustard (not the French kind, but the English kind - plain mustard powder that's been reconstituted with water), tonkatsu sauce (available at Japanese grocery stores) or steak sauce. A complete tonkatsu dinner is usually rounded out with a miso soup, some pickles and plain rice. Submitted by maki on 2004-01-05 05:25.
thanks for finally explaining to me what panko crumbs are! I kept reading about them in cookbooks and on the internet but had never managed to find out what makes them different since I've never seen them around here. you're very welcome Alberto. I have often chuckled at pretentious menus that talk about "panko" as though they were some magical ingredient :). You forgot the "sauce." The special sauce is what _makes_ tonkatsu! Do you have a recipe for that if you can't find it in the stores? On the other hand, you should have gotten rid of the shredded cabbage. I don't know where that came from--probably pre-/post-war poverty stricken Japan--but it adds nothing, and only makes you feel guilty for not eating it (why the huge pile?). Lose the cabbage and add a green salad. The shredded cabbage thing persists in cheap convenience store bento's, as well as the "salads" you get with teishoku in cheap restaurants: they use just enough lettuce on top to cover up the cabbage that constitutes the bulk of the "salad." On the other hand, a lot of Japanese food is obviously derived from "peasant food," dressed up in cultural pretense after Japan became more affluent. Sechi-ryori is pretty horrid: obviously just a conglomeration of whatever wouldn't rot quickly without refrigeration. I lived in Japan recently for 4 years and yes, they do still serve tonkatsu on shredded cabbage. In fact it's a regular thing. Just look up hokka hokka tei's online menu. Donkatsu without shredded cabbage would be too plain to me. Eating donkatsu with shredded cabbage salad is fun. It completes tonkatsu experience. The "cabbage" is essential to Asian cuisine and is served often AS a salad with a sweet sesame dressing. Trying to impart western values into foods of other cultures is a huge mistake most westerners make when trying to recreate an authentically foreign meal. Nutritionally speaking, the cabbage in the dish serves as the "fiber" portion of the meal, since the rice and meat eaten alone, over and over would not provide that element. In Thailand, cabbage is often sliced in a wedge, served raw with the intention that a bite is consumed with each spoon full of the entree or dishes served at the meal in order to compliment the texture and offset the heat of the spices. Oh and cabbage in the Asian sense, isn't necessary your grandma's variety cabbage. Sounds like Merlot would benefit from a trip or two outside his/her hometown. That looks so incredibly delicious, Maki. Is it possible to make it with ... tofu? I don't eat any meat, but the panko part just looks too good not to put on *something*! Yes, I've made it with deep fried tofu before. It's still good. Which brings us to the sauce...well I haven't really been successful at finding a good recipe for it. I've tried making it a couple of times...it's difficult! If bottled tonkatsu sauce is not available I would substitute a "steak sauce" - I know that A-1 sauce in the US is a decent substitute. Worcestershire sauce, which is available everywhere, is okay at least for the flavor. Or, do as my mother does and use soy sauce instead. While it is not quite the same as proper Tonkatsu sauce, I mix ketchup with a bit of Worcester sauce (maybe in 3:1 or 4:1 ratio). I think the result has somewhat similiar flavor and even structure. Jodi, you can use the panko coating for a lot of things. I've never tried it with tofu - if I am going to deep fry tofu, I prefer to do it another way (something else to write about, hehe) but I have used it for vegetables. A popular beer snack is preboiled potato pieces with the flour-egg-panko coating. Leek pieces are also good with this coating. The same coating is also used for korokke, Japanese-style croquettes. These all sound pretty gross. I wonder, is it really that hard to make real tonkatsu sauce from scratch?? It sort of reminds me of a scene in an old movie that was playing a lot over the holidays, Meet Me In St. Louis. They were making a huge pot of ketchup, and everyone in the family kept tasting it and adding stuff to it.. hehe. My mom taught me to make a really simple tonkatsu sauce...ketchup and worchestershire sauce. I don't know the amounts, I just mix the two together to taste. It doesn't sound good, or even authentic, but it's just the same as you would get with your tonkatsu in a japanese restaurant. Great to know how to home-make panko -- sounds much cheaper than buying it in a box! Can't do without the stuff; it's a vital ingredient for our spring parties at the beach in Hood Canal, because nobody can do without our signature super-fresh oysters fried in panko right on the beach (no need for anything but oysters and panko -- just mostly dry off the oyster with a paper towel, bread it, and toss it in the oil) are perfection. Now that I can make it, I'll have to bring the panko this year! Just wanted to thank you for your post on making Panko. It's hard to believe it could be so simple, considering that in my grocery store I pay $1.99 for a 3 1/2 ounce box of the stuff. I have been looking for a recipe to no avail until I finally found yours. I will make some tomorrow, after I have properly "aged" a loaf of good white bread. Hope it works out. I love the stuff, but resent the priciness of it. Best to you and yours! Just for any of you who might check back, including you, Maki... I kept on with my search and found a recipe for Tonkatsu Sauce on another site. It sounds about right, so I pass it on for any and all to try with their pork. Mix 1/2 cup Worchestershire sauce, 1/4 cup ketchup, 2 tablespoons soy sauce and some black pepper. Actually sounds pretty good to me, and I intend to make it myself this weekend. That sounds like something we used to do as kids at Zippy's. After meals, while waiting for the adults to finish talking we would make our own concoction of whatever was on the table: ketchup, soy sauce, pepper, salt, and sometimes worestershire sauce and tabasco! then we would dare each other to try it.. I must say, kids think of the craziest things. I just made tonkatsu the other day for the first time in awhile. I had read a recipe (on Bento.com, I think) that suggested you place breaded katsu in freezer for 20 minutes before frying to ensure crispy tonkatsu. I loved how it came out. I find the "Bulldog" brand of Tonkatsu sauce indispensable for this dish and the must-have accompaniments of my childhood include cabbage, tomato and of course rice. You can find Tonkatsu sauce at most Asian grocers. I've heard a ketchup/A.!. Steak sauce mix is a good substitute. I love using Panko, but you mention in the recipe how to make it at home you should not use a food processor and shred it by hand instead. Well, we make breadcrumbs at home, often, and I find if you put very fresh bread into a food processor and then use a lower setting the crumbs come out more like the panko you can buy. The drier the bread (for example, if you toast it in the oven first) the finer the crumb at the end. So, really, you can get a panko-like texture using a food processor. I'll have to give that a try. Thanks Erica! Quite popular in Hawaii is the substitution of chicken for pork for those not wanting to eat red meat. Also yes, the tonkatsu sauce is quite important. A mixture of worchestershire sauce and catsup usually is pretty good and is most often used for the chicken katsu version. For pork, authentic tonkatsu sauce is best. I didn't know pork was considered red meat??? I have a japanese cookbook that i use and the ingredients for the Sauce are worcestershire sauce, shoyu, and ketchup shoyu can be purchased at the world market or you can just use regular kikkoman soy sauce. other things can be added according to taste though like sugar, ginger, mirin, garlic. it's pretty much however you prefer it to taste, i think i'll add a little mirin to mine next time myself! haha. I like KIKKOMAN TONKATSU SAUCE. It tastes better than any of homemade sauces. Would it work if I used something else instead of egg? My nephew has an egg allergy but I would love to try and make this sometime. Just a quick question, would it work if you cooked the pork in the oven instead of deep frying? I've baked panko coated shrimp in the oven. They get crispy, but it's not the same sort of crispy as frying. try spritzing the panko coated cutlets (or shrimp) before baking with oil using a Misto or other such device. the oil in contact of the panko should hold a higher temp and produce a more similar crispness of oil frying. of course this adds oil/calories, which you might be trying to avoid, but you can control how much you add. The other night I wanted tonkatsu really badly, but I realized too late that I was out of frying oil. We baked them on a lightly greased cookie sheet and they turned out okay. They were crispy, but lacked the extra crunchiness (and the lovely golden-brown color) of fried. It's my first time working with panko and I realised they burn quite easily.. The curry powder and garam masala gave a bit of kick in them. I wanted to let you know that I have been reading through your site at a steady pace -- what an amazing resource! I used your tonkatsu recipe today and found it just as good as the mochi and onigiri recipes that I have tried before. I write about my experience frying it up at: http://avidalegria.blogspot.com/2008/12/fast-filling-foreign-and-fried.html. Keep the posts coming! I love them. I've been following your various blogs and really love them all - thanks for sharing all your great recipes! I know this recipe post is quite old and focuses on tonkatsu, but I'm quite obsessed with eating the shredded cabbage (japanese style) that normally accompanies the katsu but can't seem to figure out how to replicate it at home. I've tried using a mandoline, but it doesn't come out nearly as finely shredded as those served in restaurants and japan. Do you have any insights/ tricks you can share? Thanks! It's actually usually shredded with a plain kitchen knife (unless it's shredded with machines at large restaurants). Cut out the stem part of the leaves, stack the leaves, roll them up and shred finely. The only trick really is to have a sharp knife. Cut out the stem and roll. Aha! You shred basil by rolling up a small bunch of leaves and slicing, but it didn't occur to me to do the same with cabbage, which I also think is a necessity with katsu. Cutting out the thick stem part solves the problem. Thank you!!! Thank you for the tip on getting the shredded cabbage right! It was the one thing I've never managed to replicate at home. Hi! I'm a big fan of your blog and I'm planning on making some tonkatsu using your recipe.I know it's probably a bad idea but how do you pack tonkatsu for a bento you'd be eating in a couple hours? Very good question...I will address that in a full post over on Just Bento soon, but briefly, you can one of two ways - crisp it up a bit in a toaster oven or a dry frying pan, then let cool complete, or smother it with a sauce of some kind - even when it turns soft the coating is kind of tasty. I just made some katsu using this recipe and watching a "Cooking with Dog" video on youtube. I don't really know what katsu sauce is supposed to taste like, so I made a sauce out of Worcestershire sauce, ketchup, red miso and ground ginger. I stayed in Japan for about 2 years, in the town of Okazaki south of Nagoya, and there is this restaurant that makes these incredible tonkatsu with a special miso sauce. I know I will never be able to replicate the taste of that sauce, but I want to try and make something like that when I cook tonkatsu later next week. Miso paste and soy I have, but the problem is I don't live near an asian store, so getting hold of stuff like mirin will be hard. Same goes for sake. Does anyone have a good, tasty miso-sauce recipe without mirin and sake? Tonkatsu, or chicken katsu is very very popular in Hawaii too. They even serve them in local restaurants. I'm currently living in Alabama, so I have to make a lot of dishes from home too, including katsu. The sauce you can make yourself too, my dad use to make it whenever we didn't have it, he would just put ketchup, Worcestershire sauce and A1 sauce together and mix it. It tasted just like tonkatsu sauce. Put all above ingredients in sauce pan. Bring to a boil over medium heat stirring occasionally. Reduce to a simmer for 25-30 minutes skimming any foam that rises to the top. What exactly do you mean by flaking the breadcrumbs? I just love the idea of home-made panko as it is so very expensive in the stores here. It costs just under Aus$5 here. We ofen have day old bread so make our own (normal) breadcrumbs in the food processor but I am definitely going to be trying to make panko bread crumbs at home now I have a recipe! Thanks so much! First off, you want to start with a good loaf of bread - a homemade loaf would be best. If you look good bread, it has a 'grain' so to so to speak - the strands of gluten run in one direction. If you tear a loaf apart you can see this easily. What you want to do to make panko that has sharp, crunchy spikes is not to crush this grain, so grinding it up in a food processor is a definite no no. (I do use my food processor to make breadcrumbs for meatloaf and so on, where the crumb texture doesn't matter, but making panko is a manual job.) To make panko, take the white inside out of the crust, and start tearing it into small bits. Leave the torn up bits (which may still be large) in a dark place, covered with a cloth to keep away dust and insects. The next day the bits will be pretty dry. Keep tearing them up until you have panko sized crumbs. The crumbs should be spiky, not powdered. I made this for the first time last night and it was amazing! I was surprised to find panko in the supermarket so I thought I'd give it a go. My girlfriend (who is Japanese) loved it! Next time I might try making my own panko because it is a bit expensive for what is essentially breadcrumbs. This is not the first recipe I've used of yours and it certainly won't be the last. Thanks Maki! hi maki, i hope you'll see this comment. can you tell me why my batter peels off after frying? it comes off the pork when i slice it, is it because my oil is not hot enough? or maybe i used storebought panko so its too dry so it doesnt stick to the pork? please advise, thanks!! My favorite Japanese restaurant served tonkatsu with a delicious simple apple slaw that I have been trying to duplicate since I have moved away, but am not having much success with it. It was just shredded apples, and the sauce was mayonnaise-based, but it seemed to have a very light pink/peach tint to it, and I cannot figure out what was mixed with it - any ideas or suggestions?